This entry was posted in Announcements, News article on January 20, 2017 by admin. About one hundred fifty regional Sudoku winners made a swift and sure declaration to participate in the 11th Philippine Sudoku super Challenge (PSSC) which will be held at The Skydome, SM North EDSA in Quezon City on Saturday, January 28, 2017. Registration starts from 8:00am to 10:00am. Contest starts at 10:00am to 5:00pm. Other than this year’s declared PSSC regional champs, last year’s 10th PSSC national winners of every category, if they confirmed their participation, are considered official national finalists as well. Other regional winners who failed to beat the confirmation deadline are deemed uninterested participants, therefore, they are regarded as not official national finalists. The Organizer strongly prohibits walk-in participants. 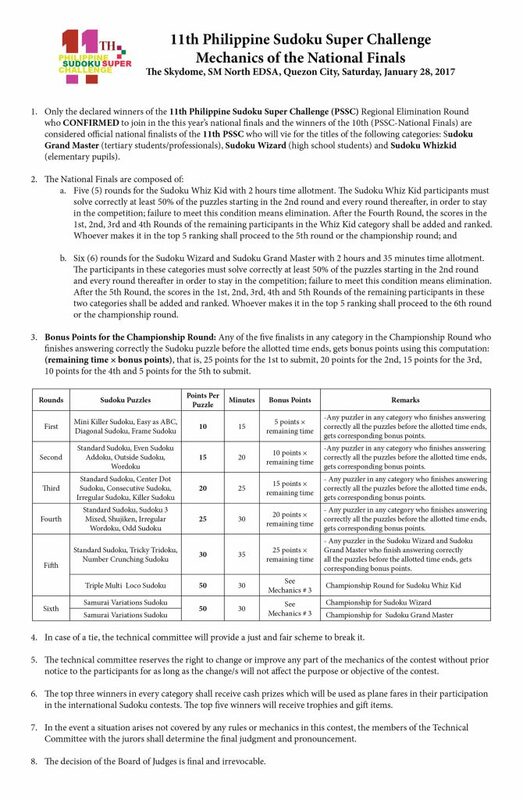 The 11th PSSC national finalists will solve around 20 to 25 puzzles in 6th rounds in approximately 2 hours in 30 minutes. Some of the puzzles are Easy as ABC, Frame Sudoku, Outside Sudoku, Addoku, Wordoku, Center Dot Sudoku, Sudoku 3 Mixed, Shujiken, Tricky Tridoku, Number Crunching Sudoku, Triple Multi Loco Sudoku and Samurai Variations Sudoku. 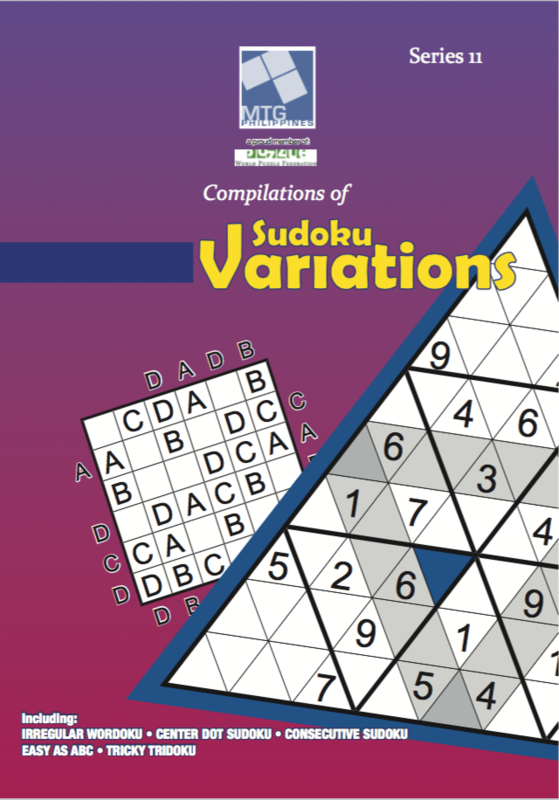 To give the participants the idea of the types of puzzles for the national finals, the Philippine Board of Studies Foundation has released the Sudoku Variation, Series 11, an ideal booklet for practice and preparation for the contest. This entry was posted in Announcements, News article on January 17, 2017 by admin.